Situated on Corn Street, right at the heart of Witney and opposite it’s sister site The Hollybush Pub, the deli is perfectly positioned for locals and tourists alike to grab a bite to eat whilst strolling around the town. 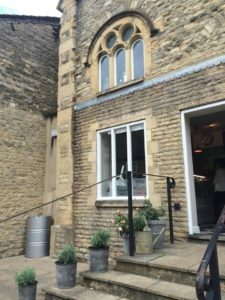 Housed in a former Church building, the shop looks super cute from the outside and even better from the inside, with quirky decor and a feature wall making it the perfect pitstop for lunch or a sweet treat. At the deli there’s a variety of different lunch items to cater for all taste-buds, from sandwiches and salads to coffee and cake, and something on offer to suit every palette. Visitors can choose from a range of Hollybush Special sandwiches, including duck and hoi sin mayo, tomato and mozzarella with pesto, or slow cooked BBQ beef brisket with melted cheese, all served on either white or brown farmhouse breads, baguettes, wraps or brioche buns (prices start from £4.40). 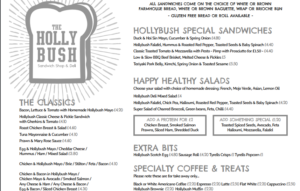 There are also a number of Hollybush Classic sandwiches to choose from, such as roast chicken breast and salad, tuna mayo with cucumber, or bacon, lettuce and tomato with homemade mayo (prices start from £3.80). If a salad is more your thing, you can opt for the Hollybush Falafel (chick pea, halloumi, red pepper, toasted seeds & baby spinach – £4.20) or the Super Salad (charred broccoli, green beans, feta cheese & chilli – £4.40). Extra items on the extensive menu come in the form of Tyrells crisps and popcorn, handmade cakes, muffins and chocolate brownies, or the famous Hollybush scotch eggs and sausage rolls which are popular with guests of the pub time and time again. I was lucky enough to have a little hamper put together for me, and was delighted to discover that it included the chocolate brownie and blueberry muffin as well as bacon and maple syrup flavoured popcorn (it was amazing, trust me) and I had a duck and hoi sin sandwich on a brioche bun, followed by the super salad which was delicious. I was also given a can of organic cola, which didn’t taste sugar laden or bad for you at all, an oatmeal strength drink and a super green smoothie, both of which are packed with nutrients designed to release energy slowly throughout the day. 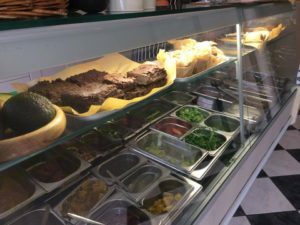 The food was home made, using fresh local ingredients, and was full of flavour – everything I tasted was fantastic and I know I’ll definitely be back next time I need some lunch when I’m in the town… It’s safe to say I was well fed that day! 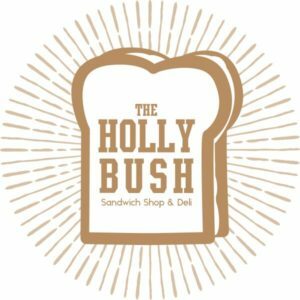 I thoroughly enjoyed my visit to The Hollybush Deli and would highly recommend it to anyone looking for good, wholesome food for their lunch break or afternoon sweet treat. If the popularity of the pub is anything to go by, I’m pretty sure that this place will go down a storm and will be a hit with everyone in Witney. 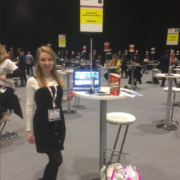 Big thanks to Luke and Megan for looking after me when we met, and for the delightful goodies that I was treated to that afternoon… Wishing Luke and Alex every success in their new business venture! NB. I was invited to review The Hollybush Deli as a guest for the purpose of this review but, as always, all thoughts and opinions are my own.